FACTS are often stranger than fiction. And they can completely change lives — for better or for worse. That in a way sums up the story of Sony Entertainment Television’s new weekend thriller. Kya Hadsaa Kya Haqeeqat, Friday to Sunday at 8 p.m., is a gripping series about a young girl who is unsure whether to believe what she sees or doubt everyone she is close to. Watch the world through her eyes as she copes with a string of murders, lies and betrayal where relationships are not what they seem. Nikki has left her small town and her unpleasant past to start life afresh. But her past follows her and she suddenly finds herself caught in a vortex of twists and turns. A story about treachery committed by those you love and trust the most. It is refreshing to see Ekta Kapoor stepping out of the overdone saas-bahu genre to step into the world of crime and mystery. Says Sunil Lulla, Sony’s Executive Vice-President, "The serial is hot and fresh. This is engaging entertainment." One hopes it is. Sony surely needs a big hit after the lacklustre Madhuri-anchored Kahin Na Kahin Koi Hai. Here’s a devilishly funny concoction of characters whose idiosyncrasies, likes, dislikes, relationships and dreams will keep you smiling from the word go. Khichdi every Tuesday at 8 p.m. on Star Plus, is about an upper middle class family which lives in the past. The world has gone ahead, but modernisation and new age does not seem to have made any impression on the family members, who enjoy life as it comes. Mohan Niwas is an ancient bungalow that houses an adventurous great-grandmother (Dina Pathak), an ensemble of puckish women and their ridiculous spouses. But they are all united on one issue — they hate the bungalow! The house is large and so are their hearts. But their arteries are blocked by a host of very real emotions like envy, jealousy, anger, bitterness and plain old loathing. They intensely dislike each other and are very united in their dream of getting separated! The Parekhs are the ideal example of a joint family where the joints are arthritic. But that’s the way they are. Honest and blunt yet, very lovable. Khichdi is their story. The serial thrives on the wicked side of ordinary people in this well-made comedy. It’s being publicised as a soap that would be a beacon to all other soaps. But with its numerous characters and subplots, all it would do is to leave viewers groping in the dark. Virasaat on Sahara TV, Monday to Friday at 8.30 p.m., revolves around — like most daily soaps — a large family with all its intrigues, jealousies, feuds and petty quarrels. 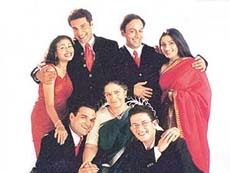 Balram and Jayashree Sahni, their three sons, two daughters and a fourth son Manav from Sahni’s first wife. They all make a lovey-dovey parivar. But things start souring once the kids grow up. The root of the dispute is the flourishing textiles and construction business. When Sahni dies, Manav takes up his father’s place. But being naive, he is soon cheated of his business by a maternal uncle. The family can’t take the blow and has to move out of the palatial bungalow into a small tenement. From there onwards starts the re-building process. But alas, it’s too late. No, not for the Sahnis, but for the soap. By this time it has got tangled in too many side stories — a handicapped son, another who gets married to a greedy wife and a daughter hopelessly in love. Too much for a viewer to take in one evening! Apparently old is not very old at Star Gold. The channel which was supposed to bring alive the heady forties, fifties and sixties decades of Hindi cinema has settled for the simpler task of featuring present stars. Take, for example, the currently-on Bollywood Memsaab every Saturday at 7 p.m. The series is showcasing films of present actresses like Urmila Matondkar, Tabu, Manisha Koirala and Deepti Bhatnagar. Which defeats the purpose of a channel devoted to the golden era of films where women played a dominant role. From the passive wife of Dadasaheb Phalke’s Raja Harishchandra to the long-suffering but heroic mother-figure of Mother India and the lilting Anarkali of Mughal-e-Azam, it has been a rather long and challenging journey for women in Hindi cinema. Bollywood has been in tune with the woman’s desires, feelings, and independence. But on Star Gold, instead of watching films of all-time greats like Nargis, Madhubala, Meena Kumari and Nutan, you would now have to settle for the present era women like Urmila, Manisha and Deepti Bhatnagar — a virtual non-starter in Hindi films! Urmila (with Govinda): Vintage star? Though her life has been more colourful than all the soap heroines she writes about, Vinta Nanda never ceases to experiment. Starting off as assistant to Raman Kumar in the eighties’ comedy Yeh Jo Hai Zindagi, and then going on to write the hit daily soap Tara, this Chandigarh lady has seen the ups and down of glamworld. And now she’s on pastures new. Vinta is all set to produce and direct her first feature film Kali about a child widow. 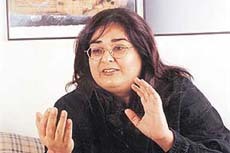 She is also enthusiastic about another directorial venture she is co-writing with Mahesh Bhatt. Called White Noise, it’s in English and based in Mumbai. Vinta, who drew flak from a section of viewers for showing women in a poor light, says that over the years, her writing has matured and she’s able to have a far better control over her characters. She says that her recent small screen successes like Aur Phir Ek Din, Umeed, Shatranj, Agnichakra and Rahat bear testimony to that. No, she says, she’s not abandoning TV for Bollywood. She’d like to work for both. "But I am very excited about my new work. I can assure you these are going to be very offbeat movies." And if her Tara success is anything to go by, they may be well worth a wait. Protecting the innocent, vanquishing evil and evil doers, and righting wrongs are not exactly on the agenda of every 20-something on the fast track to discovering what life’s all about. But for the Halliwell sisters, it is their destiny. Charmed, the new thriller on Star World every Wednesday at 7.30 p.m., explores the relationship between three siblings, who after discovering that they possess supernatural powers, are reluctantly thrown into a world of doing good and fighting evil. Starring Alyssa Milano, Shannen Doherty and Holly Marie Combs, the trio of sisters must keep their identity secret from the world with only themselves to rely upon. Eldest sister Prue is the most responsible but she has lightened up her serious tone by becoming a professional photographer. Piper manages a nightclub and is romantically involved with a guy. But she never lets her love affair interfere with fighting evil. Phoebe is free-spirited and though in college, she thoroughly enjoys being a good witch. Join the three stunning sisters in an exciting journey of thrills, suspense and action.